He didn’t miss a beat, Raeder says. A senior vice president at Morgan Stanley Smith Barney, Sarly said he had always wanted to own a gallery. “Well, why don’t you?” asked Raeder. Shortly thereafter, he called to say he would do it, but only if Raeder would join him in the endeavor. 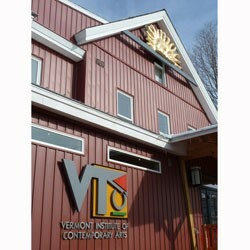 Their “baby,” the Vermont Institute of Contemporary Arts in Chester, had its soft opening last month. The renovated American Legion hall was packed to the brim for “Abstractions,” an exhibit featuring the meditative paintings of Sandgate artist Harry Rich. Raeder is a Long Island native who moved to Andover, Vt., about 10 years ago. She is 59 but has the enthusiasm — and bouncy blond hair — of a much younger woman. It’s easy to see how she convinced Sarly to dive into the VTica project. Before her turn as executive director, Raeder spent several years traveling the world. She likes to say she did the Eat, Pray, Love thing before the book (and movie) came out. “One day, I had an itch,” Raeder says. “I had to get out.” She taught English in Thailand and spent two weeks in a Buddhist monastery there. “I’m a girl who wants to be challenged,” she says. Raeder believes her strength is identifying and filling creative niches, which is exactly what she hopes to do in Chester with Sarly. Since the two began developing their vision for VTica, Raeder has identified more than 600 contemporary artists working in Vermont, and she’s trucked around the state to meet many of them. They all told her the same thing: They sell their work in New York City and other urban centers, not in Vermont. She and Sarly also emphasize artist talks, musical performances and other events. They’re interested in the creative process, “not just flat art,” Raeder says. In February, for example, they’ll host a series of talks called “The Next Big Thing: Mind Uploading” with Bruce Duncan, the Bristol-based managing director of the Terasem Movement Foundation. Duncan’s nonprofit creates interactive digital avatars — robots programmed with replicas of human brains. He’ll return in March and, with avatar BINA 48 in tow, in May.